Halloween is taken as an opportunity to commit crimes through using an expected act such as trick or treating. 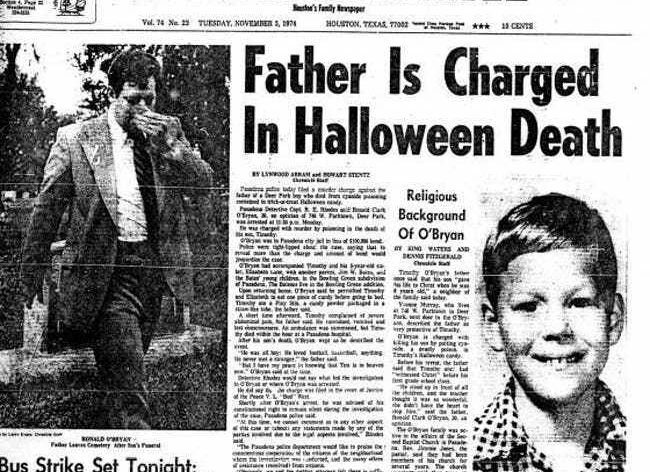 The father of Timothy O’Bryan had used this very activity to give his child pixie sticks as his first candy received on Halloween. After dying an hour after consumption, it was found that the candy was poisoned through the use of cyanide. Further investigation found that the father had the father was drowning in debt and was counting on the life insurance policies placed on his children to help him. He was sentenced to death in 1984. It is unfortunate the extremes that people go through to get out of poverty, even harming their own offspring.